Amelia Beerhart: Hogworts: Beer and Magic! Last night I began my beer internship in earnest with the Malt Solutions brewing course. This is where we get into the nitty gritty of actually making good beer, including all the technical beer jargon and the science (or the magic, depending on your point of view) of it all. Eleven keen would-be home brewers, including myself, arrived at the Ale Brewing Chaps nano-brewery, notebooks in tow, to learn from the Beer Wizard: Professor Alan Knight. The first step to making good beer is having good water. In places like Dublin and Edinburgh the water is soft. It doesn’t contain the minerals and salts (calcium sulfate, calcium chloride or magnesium sulfate) found in places like Burton on Trent in the British Midlands, or London. Luckily, beer can begin with either hard or soft water, and styles of beer have developed regionally to take advantage of the water available. In brewing parlance, the water used in the making of beer is referred to as Liquor, which differentiates it from the water used to clean the brewery floor. If, as on Waiheke Island, you have soft water, salts and minerals can be added depending on what type of beer you want to make. The next necessity is malt. 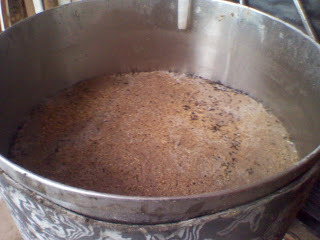 Barley malt is the most commonly used, though other grains have been experimented with throughout the course of Beer’s history (which is exceedingly long). Barley was once a wild grass, which has now been domesticated. In the process of malting barley seed, the seeds are saturated in water which is continuously changed and the seeds are allowed to germinate. 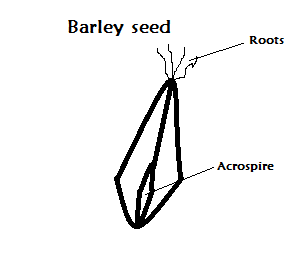 Tiny rootles emerge and the acrospires is allowed to grow about halfway up the seed before germination is halted by putting the barley seeds into a kiln. At this stage the barley can be lightly toasted yielding a pale bohemian pilsner malt, or a slightly darker crystal malt. The darkest malts, like chocolate and patent black are achieved by a longer toasting in the kiln with more heat. Once the barley is malted and toasted it’s ready to be milled. In milling, the grain is not completely pulverised, it is broken open to allow the enzymes in the aleurone layer to come into contact with the starch inside the grain, after which it is referred to as grist. 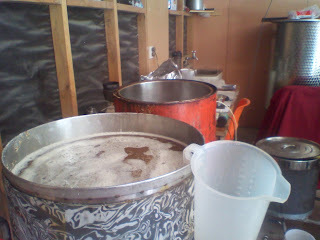 So far, we have water, and toasted, milled, barley malt. 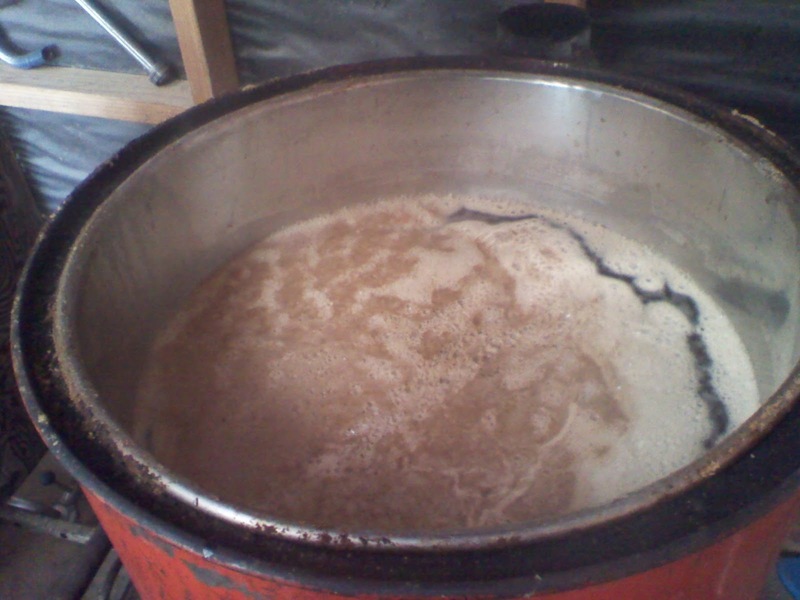 Heat the water to around 80°C and into the mash tun it goes, where it is quickly combined with hot water and all the clumps of grain are broken up using a rouser. The cooler grain, when added, should take the temperature down to between 62°C and 70°C, which is the ideal temperature range for the enzymes (α-amylase and β-amylase) in the aleurone layer of the barley malt to turn the long starch chains into highly fermentable sugars. This is the aleurone layer, located between the hard husk of the barley and its starchy innards. 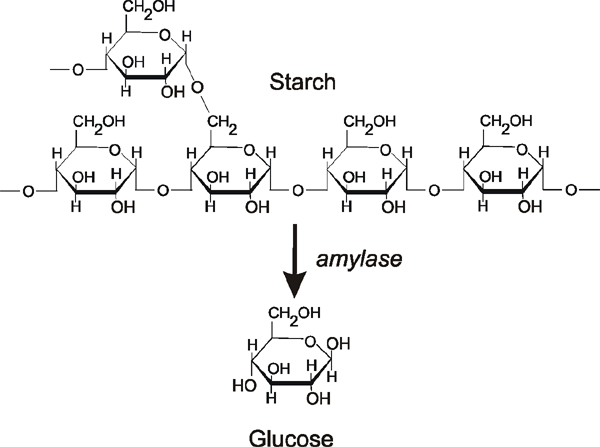 The α-amylase works in the lower temperature ranges of 62°C - 65°C, and cleaves the starch molecules near the end of the starch chains, creating small molecules of highly fermentable maltose. 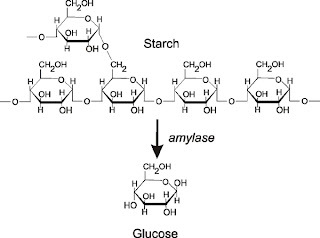 The β-amylase works in the higher temperature ranges of 66°C - 70°C and cleaves the starch chains closer to the middle, creating unfermentable sugars. These longer maltose chains are what give a beer its sweetness, the malty, biscuity flavour you taste as you raise a cool glass to your lips on a hot summers day. It takes around an hour for the starch to fully convert, assuming all you put in was barley malt. Additions of wheat, corn and oats are all possible, but since they contribute very few enzymes of their own, the whole conversion process takes much longer. If you’re planning a wheat beer, it is highly advisable to bring your knitting, or a good book. Now add hops. Hops are fantastic, and they come in all sorts of varieties. For an averagely hoppy beer the first gift or first addition of hops should be about 1g of hops per liter of wort. The first gift is what gives a finished beer its deep background bitterness, and since these hops will be boiled for around 90 minutes and will lose all their floral aromatic oils we must add more hops. A lot more hops. The second and third additions are added later in the boil, and these contribute to the floral, hoppy aromatics of a finished beer. You can get very creative with when you add hops to wort, and in what quantities, but a good rule of thumb is add the first gift as soon as you get a rolling boil on the kettle, the second lot at 75 minutes, with some kettle finings and yeast nutrient, and the finishing hops about 5 minutes before the end of your 90 minute boil. You can really go to town with the last addition of hops; after all, these will only be in contact with the wort for 5 minutes. 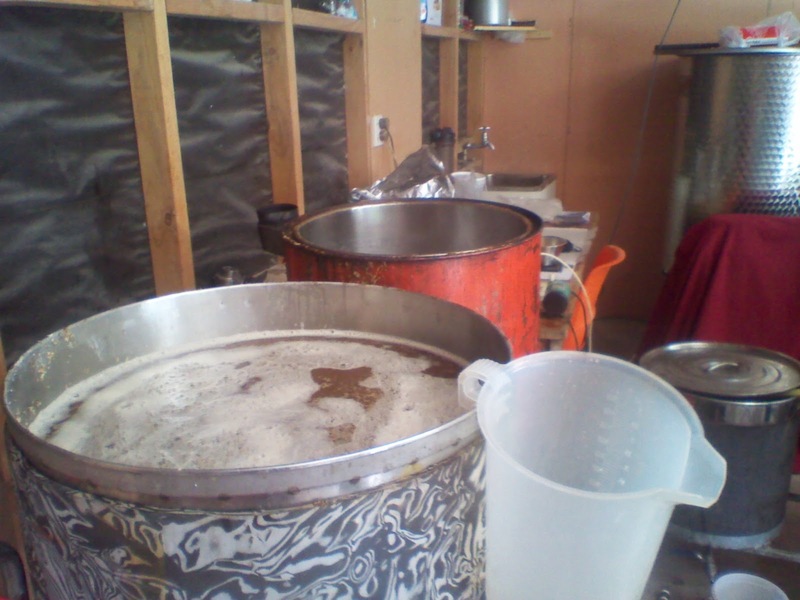 When the boil is finished, bring the temperature of the beer down as fast as possible. You can do this by adding some cold water to replace the liquor that would have been lost in the boil. 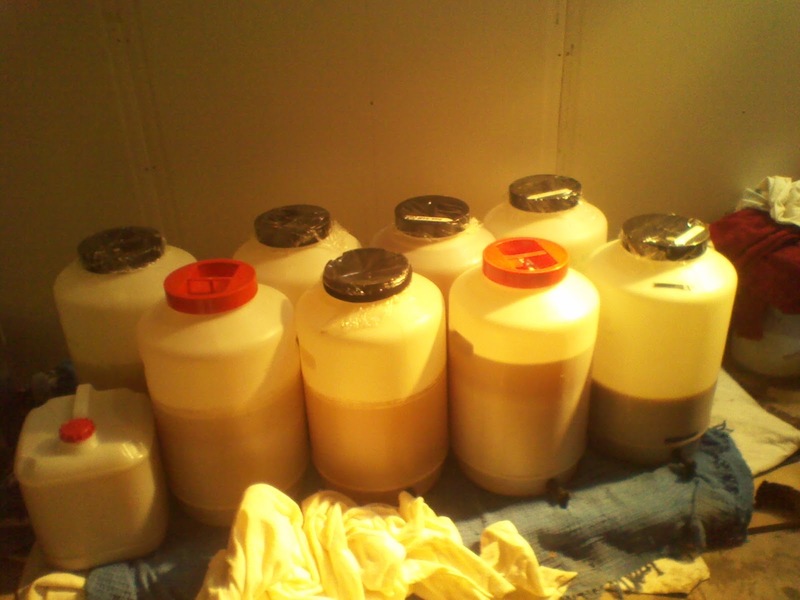 This prevents any nasty dimethyl sulfide tastes from forming (something like moldy sweet corn). Whirlpool the wort to separate the trub into a cone at the bottom. 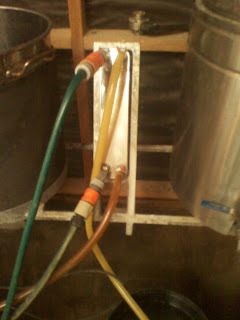 Pass the wort through a heat exchanger to bring it down still further in temperature. 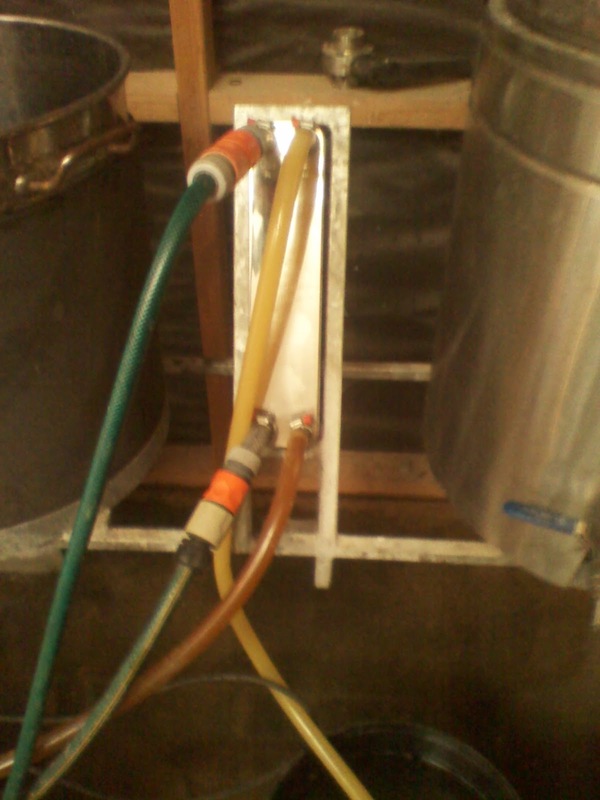 When the wort hits the fermenter it should be around 20°C so the yeast will be nice and happy. Adding the yeast is another magical part of the brewing process. For 3 or 4 millennia, humans used the stuff without having the faintest clue what it was, and up around 200 years ago, it was thought to be a chemical byproduct of the fermentation process itself. Theorising that yeast was in fact a living organism, that metabolised sugars and excreted ethanol, Cagniard de la Tour, was laughed at and mercilessly mocked, (perhaps farts were even aimed in his general direction) until Lois Pasteur was able to prove experimentally that Carniard was right. There are around 1,500 different species of yeast, but in brewing beer you only really need to know about Saccharomyces cerevisiae the top fermenting ale yeast and Saccharomyces pastorianus, the bottom fermenting lager yeast, which can also be called S. calsbergensis after the brewery that cultivated the first single cell culture. 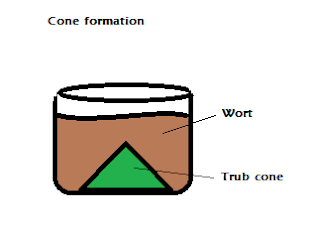 The two types of yeast are metabolically different, so it is very important not to cross-contaminate yeast cultures. A note about fermenters: they need to be absolutely sterile. The best way to get them to this state is to rinse them with caustic soda, followed by sanitation with oxonia. Then rinse them again thoroughly with hot water. Compared to wine and spirits, beer is actually quite delicate and easy to spoil, particularly if you live in an area with a lot of wild yeast. All good brewers (and brewsters) know that a certain amount of magic is involved in making beer. Scientists have now shown the actual process by which the magic is worked, so welcome to Hogworts! Ooooh just look at all our lovely full fermenters!! 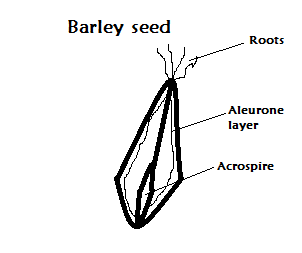 the pictures of barley seeds look like vaginas.